This manual contains a wealth of information to help you diagnose abiotic disorders in landscape plants disorders caused by environmental, physiological or other nonbiological factors. You ll learn how to diagnose injury symptoms from over 20 different abiotic agents including water deficit, nutrient deficiencies, salinity, pH, sunburn, air pollution, herbicide and other chemical phytotoxicities, mechanical injuries, lightning, wind, and hail. You ll also learn how to develop a step-by-step diagnostic strategy. 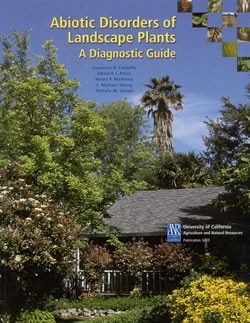 Included are strategies, techniques, and tools you can use in diagnosing plant problems, common injury symptoms and their abiotic causes, and plant traits that can resemble abiotic disorders. Illustrated with 319 color photographs and 38 tables, this book is a "must-have" for the library of every landscape professional.